The entry covers the application of InfuGreen 810 bio resin in the production of the SeaBubbles water taxis prototypes. Sicomin plans to showcase its new engineering services and exhibit a variety of key product ranges including bio, clear, fire retardant and foaming epoxy systems at the JEC show. Sicomin has also been selected as a finalist for a joint entry within the ‘Smart Cities’ category with Decision SA. 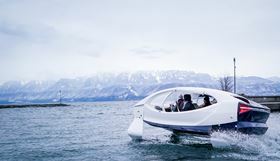 The entry covers the application of InfuGreen 810 bio resin in the production of the SeaBubbles water taxis prototypes. As an eco-friendly mode of transport, the SeaBubbles required a bio-based infusion resin that demonstrated the equivalent performance to a conventional resin and which also enabled a high-volume manufacturing technique. Sicomin overcame the challenges associated in formulating a product that combined these two factors and created InfuGreen 810; the first bio-epoxy, infusion specific, resin that is a cost effective, low viscosity system available in industrial volumes. Prepreg specialists North Thin Ply Technology (NTPT) plans to showcase a number of applications where its materials have been used at JEC World.